Missing teeth can cause numerous health issues, but it can also cause a drop in your confidence and self-esteem. That’s why at Geach Dental, we offer expertly placed dental implants to create long-lasting and natural-looking tooth replacements. Their stability and health benefits are unmatched, which is why they’re regarded as the only comprehensive replacement. If you’re considering dental implants, you might be wondering about the process and how long it may take. Keep reading to take a look behind-the-scenes of dental implants and the process of receiving them. During your initial consultation, you’ll meet with our expert dentist, Dr. Adam J. Geach, to discuss your smile goals. He will carefully examine your grin to see where you’ll need implants as well as how many you need. Additionally, he will evaluate your overall oral health and correct any issues to ensure you’ll have a positive treatment process. He will also check the strength and size of your jawbone to see if it can accommodate dental implants. This stage of the process is where Dr. Geach may have to recommend a bone graft to ensure the success of your implants. This is a procedure that builds up and strengthens your jawbone so that implants can be placed. Dr. Geach, an expert implant dentist in Downtown Los Angeles, will make a small incision in your gums to expose your jawbone. He will then drill a tiny hole into your bone, where he will place your dental implant. 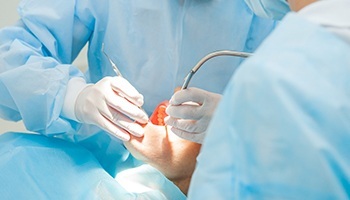 Although this sounds painful, you will be completely numb, and we also offer sedation dentistry to keep you relaxed during surgery. Additionally, your bone doesn’t have any pain-sensing nerves, making this a more comfortable experience than you may expect. Here is where the magic happens. 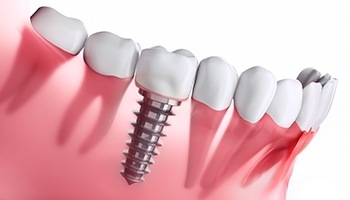 Because dental implants are made of titanium, they actually integrate into your bone. This osseointegration process can take 4 to 6 months, but the result is a sturdy and stable support for dental restorations that can last a lifetime. During this waiting period, you’ll be given a temporary crown to fill the gap in your smile. Once your implant has fused to your jawbone, Dr. Geach will take your temporary crown off and attach an abutment. This is a connector that allows for the placement of a permanent crown, bridge, or denture. Once your dental implant is integrated into your jawbone and it is fastened with an abutment, Dr. Geach will attach your restoration of choice. Whether you need a crown, bridge, or denture will depend on your health and how many teeth you’re missing. 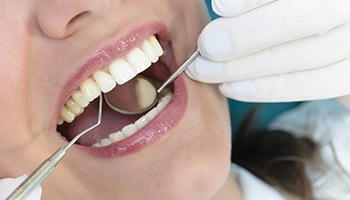 While this overall process may seem long, it is the only tooth replacement solution that offers incredible health benefits in addition to a natural looking and feeling smile. Contact our office today to get started on a complete, strong, and beautiful set of teeth. 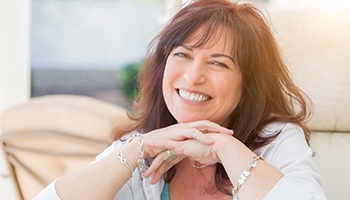 Have Questions About Dental Implants We’ve Got the Answers.